Although as I mentioned in this post on circular helio bar charts, polar coordinates are unlikely to be as effective as rectilinear coordinates for most types of comparisons, I really wanted to use a circular histogram in a recent paper of mine. The motivation is I have circular data in form of azimuths (Journey to Crime), aggregated to quadrants. 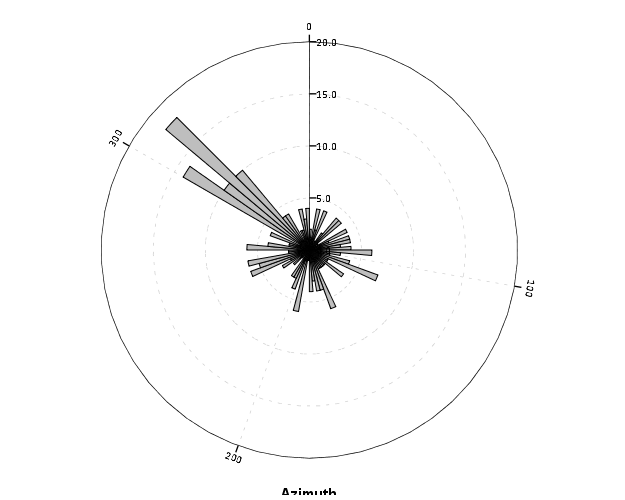 So I really wanted to use a small multiple plot of circular histograms with the visual connection to the actual direction the azimuths were distributed within each quadrant. 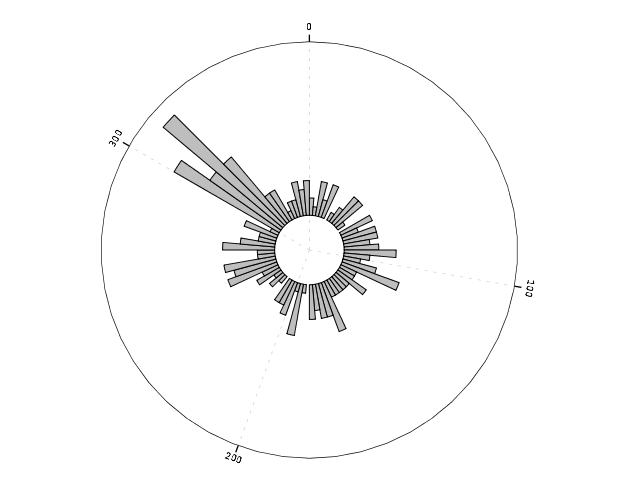 Part of the problem with circular histograms though is that the area near the center of the plot shrinks to nothing. And here is that technique extended to an example small multiple histogram from an earlier draft of the paper I previously mentioned. Even with the offset, the problem of the shrinking area is even worse because of the many plots, and the outlying bars in one plot shrinks the rest of the distribution even more dramatically. So, even with the offsetting it is still quite difficult assess trends. Also note I don’t even bother to draw the radius guide lines. I noticed in some recent papers about analyzing circular data that they don’t draw bars for circular histograms, but use dots (and/or kernel density estimates). See examples in Brunsdon and Corcoran (2006), Ashby and Bowers (2013), and Russell and Levitin (1995). The below image is taken from Ashby and Bowers (2013) to demonstrate this. The idea behind this is that, in polar coordinates, you need to measure the length of the bar, instead of distance from a common reference line. When you use dots, it is pretty trivial to just count the dots to see how far they stack up (so no axis guide is needed). This just replaces one problem for other ones, especially for larger sample sizes (in which you will need to discretize how many observations a point represents) but I don’t think it is any worse than bars at least in this situation (and can potentially be better for a smaller number of dots). One thing that does happen with points is that large stacks deviate from each other the further they grow towards the circumference of the polar coordinate system (the bars in histograms typically get wider). This just looks aesthetically bad, although the bars growing wider could be considered a disingenuous representation (e.g. Florence Nightingale’s coxcomb chart) (Brasseur, 2005; Friendly, 2008). Unfortunately, SPSS’s routine to stack the dots in polar coordinates is off just slightly (I have full code linked at the end of the post to recreate some of the graphs in the post and display this behavior). With alittle data manipulation though you can basically roll your own (although this is fixed bins, unlike irregular ones chosen based on the data like in Wilkinson’s dot plots, e.g. bin.dot in GPL) (Wilkinson, 1999). And here is the same example small multiple histogram using the dots. Here I have posted the code to demonstrate some of the graphs here (and I have the full code for the Viz. JTC paper here). 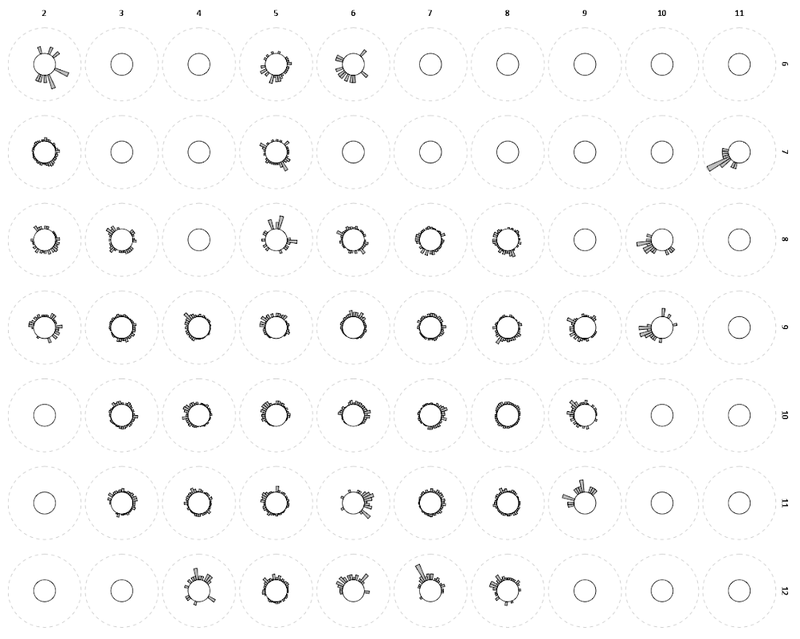 To make the circular dot plot I use the sequential case processing trick, and then show how to use TRANS statements in inline GPL to adjust the positioning of the dots and if you want the dots to represent multiple values. Ashby, Matthew P.J. & Kate J. Bowers. 2013. A comparison of methods for temporal analysis of aoristic crime. Crime Science 2(1). Brasseur, Lee. 2005. Forence Nightingale’s visual rhetoric in the rose diagrams. Technical Communication Quarterly 14(2):161-182. Brunsdon, Chris & Jon Corcoran. 2006. 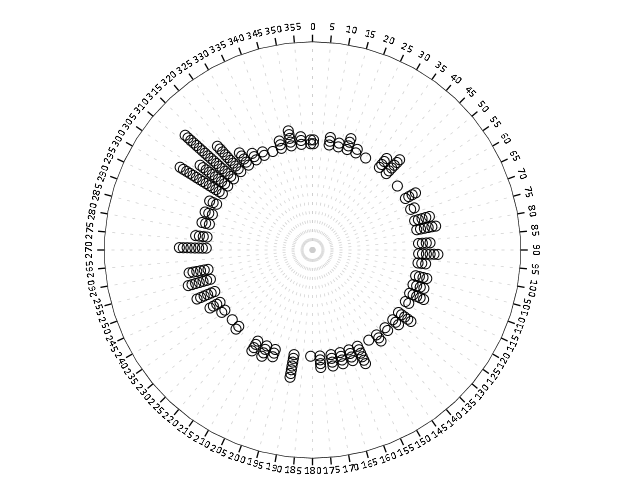 Using circular statistics to analyse time patterns in crime incidence. Computers, Environment and Urban Systems 30(3):300-319. Friendly, Michael. 2008. The golden age of statistical graphics. Statistical Science 23(4):502-535. Russell, Gerald S. & Daniel J. Levitin. 1995. An expanded table of probability values for Rao’s spacing test. Communication in Statistics: Simulation and Computation 24(4):879-888. PDF Available here. Wilkinson, Leland. 1999. 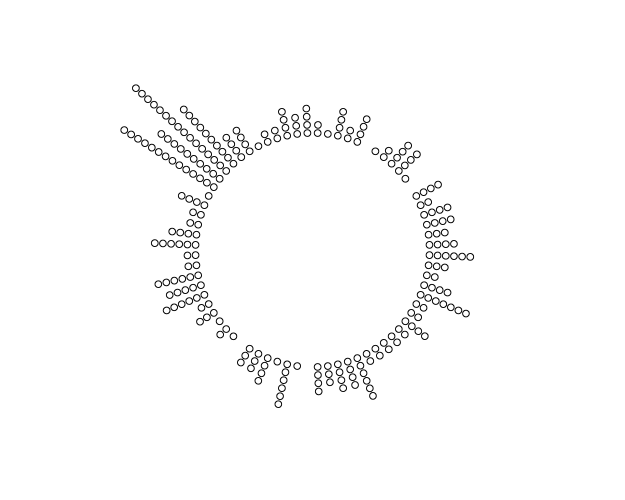 Dot plots. The American Statistician 53(3):276-281. PDF Available here.